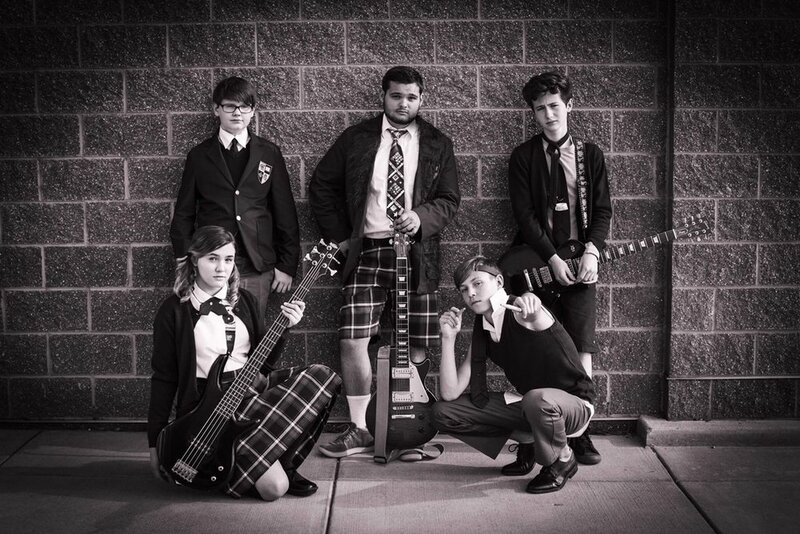 Members of the School of Rock band strike a pose befitting their rock star status in "The School of Rock," presented by Sudbrink Publications. Pictured are, from left top, Lawrence (Ryan Vanselow), Dewey (Thomas Madrzak), Zack (Cian Radcliffe), bottom, Katie (Ivy Broder) and Freddy (Zander Tomes). If you’re wondering what a group of 47 young people might have been doing hanging around Pewaukee High School all summer you can be sure they were hard at work – hard at work and having the time of their lives. At least that’s what it looked like at Sunday’s performance of “School of Rock: The Musical,” presented by Sudbrink Performance Academy at the high school. There’s no doubt there were some long hours and dedicated work put in here because these young performers, ranging from age 8 to 18, put on an energetic, high quality show that the big crowd appreciated with copious applause. Directed by Jacob Sudbrink with choreography by Jes Sudbrink, this production is all-systems-go with great music under the direction of Anne Van Deusen, good lighting, a versatile set (Mark Brooks) and some really sharp, well-fitting uniforms for the large group of students, as well as age appropriate outfits and hair for performers playing teachers and parents. Darcy Devens and Lori Vanselow handled costume design. All this provided a first-rate backdrop for this finely-tuned group of performers headed by Thomas Madrzak in the lead role of Dewey Finn, the unemployed, wannabe rock star leeching off his best friend, a substitute teacher named Ned (William Madrzak), and Ned’s overbearing girlfriend Patty (Mainyia Xiong) in their apartment. One day, an exclusive school calls Ned’s apartment asking if Ned would want a substitute job that will pay quite well. Dewey impersonates Ned and winds up at the middle school, where he foregoes traditional subjects and instead teaches the kids rock music. The school principal, Rosalie Mullins (Mary Ellingen), is appalled, yet intrigued by Finn’s unorthodox (to say the least!) methods, and the two develop a love interest. Dewey’s main goal is to prepare the kids for a rock competition, necessitating his choosing four instrumentalists, back-up singers and support staff from the class. The group, known as School of Rock, has its own manager, the class over-achiever, Summer (Emma Hipp). Dewey spends his time teaching the class his theories – musical and otherwise – and rehearsing, unbeknownst to school personnel and parents, for the big gig. The whole show revolves around Dewey, and this production has a good one in Thomas Madrzak, 18. His Dewey exudes a fast-talking, devil-may-care con man attitude. And when he tells the band members they should be “loosey-goosey” cool, he’s practicing what he preaches. Plus, his limber singing voice is well-suited to the music. Dewey is totally into himself, perhaps best demonstrated in “In the End of Time,” in which Madrzak imitates all the instruments and even inserts stage directions (“and the fog rolls in around my ankles”). The audience loved it! As Rosalie, Ellingen is also wonderful, giving her character an appropriate stuffy air and look. Her strides are purposeful and her commanding stance gives her a mature, take-charge attitude. Best of all, she sings beautifully, handling even the brief operatic moments without a hitch. In “Where Did the Rock Go?” Rosalie literally lets her hair down as she recalls the passion she once felt in music and how that faded through the years. Ellingen’s voice gets soft and pensive, then grows into powerful crescendoes in the lovely-rendered tune. Xiong as Patty, the show’s heavy who browbeats everyone in her path, maintains a strong presence and presents equally strong vocals in “Mount Rock.” As her meek boyfriend, Ned, William Madrzak (brother of Thomas) is nerdy, yet likeable. The four student musicians in the School of Rock – Zander Tomes on drums, Ivy Broder on bass, Cian Radcliffe on guitar and Ryan Vanselow on keyboards -- all performed capably. I especially enjoyed Vanselow, whose not-cool Lawrence is fun to watch as he transforms into a rock star. Tomes’ Zack dispays a low-key, brooding attitude that works well for his character, who is belittled by his father. Hipp’s Summer is nicely done and she really nailed all the tricky lyrics in the Act 2 opening tune “Time to Play.” As the shy Tomika, Margaret Walloch exhibits a pure, clear voice in “Amazing Grace” and “If Only You Would Listen,” while Luke Wenger’s Billy adds much personality and some comic moments as the band’s stylist the show in the show. The Dance Features (Macey Hathaway, Malory Hathaway, Malina Jacobson and Erin Muntz) also presented some outstanding moments, exhibiting moves from gymnastics to ballet. Anne Van Deusen-led orchestra maintained a full sound and pulsating beat that was obvious, yet seldom overpowered the vocals and kept a full-steam-ahead pace to all the music. Everything about this show is well-done – from the themed treats in the lobby to the program cast descriptions and photos. The only issue was a few sound discrepancies, a few mikes that didn’t get turned on quickly enough and perhaps a couple performers who should have been miked.